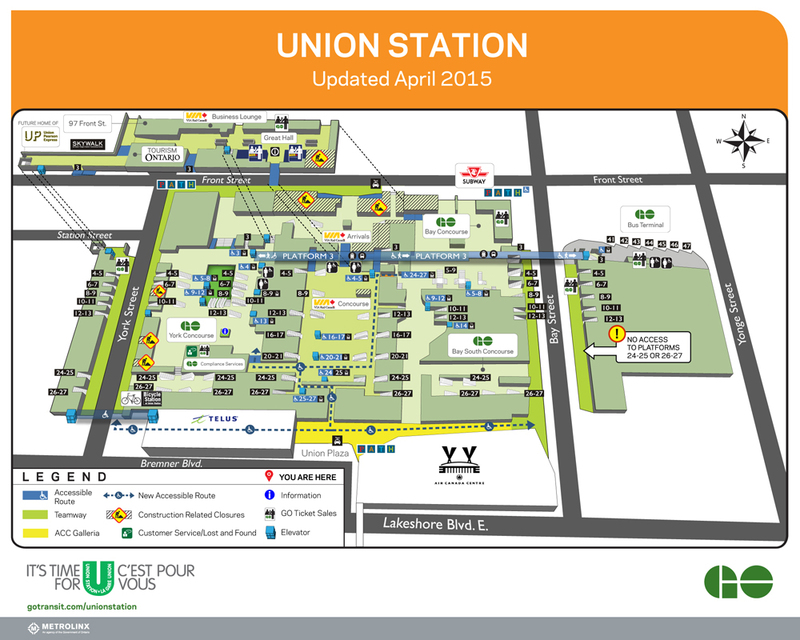 The new GO Transit York Concourse at Union Station will open for business on Monday, April 27. After years of construction and an ever-changing maze pf construction hoarding, the new concourse will show off what the Union Station Revitalization project is all about. Anyone who travels through Union Station knows the old, crowded GO Transit area under the East Wing of the station. Passengers rushing for trains jostle with queues in the fast food court and the ticket area. The York Concourse opens up space under the West Wing that formerly housed baggage services and parking, an area that for most users of the station simply didn’t exist because much of it was off limits to the public. The new concourse will add about 50% to the available passenger space and will open up circulation between the waiting areas and the tracks above, not to mention adding new ways to get into and out of the station. This map looks north with the existing Bay concourse at the right hand end of the station. On either side of Bay Street are the old freight teamways which are now pedestrian paths under the rail corridor and access to tracks above. In the middle of the station is the Via concourse which is not affected by this work. To the west (left) is the new York Concourse. Both the Bay and York concourses will remain open until after the Pan Am Games this summer, and the Bay Concourse will then close for a renovation to match the new York Concourse with a target reopening date early in 2017. Concurrent work will include completion of the new lower level shopping concourse in two stages (under Via in 2016, and under the Bay Concourse in 2017), as well as heritage restoration of the Great Hall and the East Wing of the building. The goal is to have three times the space GO Transit has today to serve at least twice the passenger volume. Also opening will be new accesses to the station and tracks including the first phase of the NorthWest PATH link across Front Street (eventually to extend north to Wellington Street) and the York East Teamway providing another set of stairs up to track level and access to the station itself. The photo gallery below is from a media tour on April 24, 2015. This stair and escalator (plus a nearby elevator) link the Great Hall into the York Concourse. Old (rehabilitated) columns and new stairways under the tracks. Looking south in the York Concourse toward the ticketing area. Ticket queue and schedule kiosk at the south end of the York Concourse looking west. Looking west in the York Concourse across the opening down to a future food court. The lower area will become a food court. Many escalators link the levels of the new concourse. Looking north from the York Concourse toward the Front Street doors. South of the Front Street doors at York Street. Outside of the Front Street doors east of York. Looking west in the “moat” under the entrance bridge to the West Wing. Looking north to the NW Path entrance. The first phase of the new NorthWest path link under Front Street at York. The north end of the NorthWest Path. The elevator from the NW path up to street level. At street level outside of the exit from the NW Path. Looking south toward the East Teamway on York Street. Inside the new York East Teamway looking south. Inside the York East Teamway looking north.